In his apostolic letter on suffering, Saint Pope John Paul points out that Jesus Christ, by His own suffering and death as our Redeemer, has conquered suffering in our lives. His own love -- the love of God for us -- has given an answer to the question "Why?" that no one could ever have imagined on his own. Christ's victory over suffering, indeed over death itself, gives us hope, it lights a fire in the midst of darkness, it promises eternal life. Perhaps this promise John Paul makes seems like a platitude to some. But Jesus not only suffered, He suffered in innocence. He, in His own Body, answered the often repeated "Why?" about the good suffering when they don't deserve it. WASHINGTON (CNS) -- Pope Francis made a previously unannounced 15-minute stop Sept. 23 at a Washington residence operated by the Little Sisters of the Poor, where he met with about 45 sisters. Sister Maria del Monte Auxiliadora, the mother superior was told after the ceremony that Pope Francis wanted to make a five-minute visit to the Jeanne Jugan Residence, located across the street from the Basilica of the National Shrine of the Immaculate Conception and not too far from the St. John Paul II Seminary. Big cities…conceal the faces of all those people who don’t appear to belong, or are second-class citizens. In big cities, beneath the roar of traffic, beneath “the rapid pace of change”, so many faces pass by unnoticed because they have no “right” to be there, no right to be part of the city. They are the foreigners, the children who go without schooling, those deprived of medical insurance, the homeless, the forgotten elderly. These people stand at the edges of our great avenues, in our streets, in deafening anonymity. They become part of an urban landscape which is more and more taken for granted, in our eyes, and especially in our hearts. Knowing that Jesus still walks our streets, that he is part of the lives of his people, that he is involved with us in one vast history of salvation, fills us with hope. A hope which liberates us from the forces pushing us to isolation and lack of concern for the lives of others, for the life of our city. A hope which frees us from empty “connections”, from abstract analyses, or sensationalist routines. A hope which is unafraid of involvement, which acts as a leaven wherever we happen to live and work. A hope which makes us see, even in the midst of smog, the presence of God as he continues to walk the streets of our city. The prophet Isaiah can guide us in this process of “learning to see”. He presents Jesus to us as “Wonderful Counselor, the Mighty God, the Everlasting Father, the Prince of Peace”. In this way, he introduces us to the life of the Son, so that his life can be our life. Wonderful Counselor. The Gospels tell us how many people came up to Jesus to ask: “Master, what must we do?” The first thing that Jesus does in response is to propose, to encourage, to motivate. He keeps telling his disciples to go, to go out. He urges them to go out and meet others where they really are, not where we think they should be. Go out, again and again, go out without fear, without hesitation. Go out and proclaim this joy which is for all the people. The Everlasting Father. No one or anything can separate us from his Love. Go out and proclaim, go out and show that God is in your midst as a merciful Father who himself goes out, morning and evening, to see if his son has returned home and, as soon as he sees him coming, runs out to embrace him. An embrace which wants to take up, purify and elevate the dignity of his children. A Father who, in his embrace, is “glad tidings to the poor, healing to the afflicted, liberty to captives, comfort to those who mourn” (Is 61:1-2). Prince of Peace. Go out to others and share the good news that God, our Father, walks at our side. He frees us from anonymity, from a life of emptiness and selfishness, and brings us to the school of encounter. He removes us from the fray of competition and self-absorption, and he opens before us the path of peace. That peace which is born of accepting others, that peace which fills our hearts whenever we look upon those in need as our brothers and sisters. And he is always asking this question of us. - Who was Jesus for us when we were 17/18 years old? - Who did we say Jesus was for us in college? the losses and pain that come into every life? The stark simplicity of Jesus’ question is disarming. and puts the burden on me to say who he is in my life. In a sense, my job as the preacher is easy today. Truth is, many of us may have more than one answer to the question. but on Wednesday I might be slow even to mention his name. might be different than who I say he is when all’s going well. who want to follow him. but sometimes, in our pain, we feel he’s forgotten or abandoned us. • Who I say Jesus is might change, a lot, as I grow older. and learn and deepen my faith and understanding. is the same one I gave when I was a child. Jesus doesn’t change but: We. Do. change and grow and deepen. and how does it need to continue to change? that Jesus is the Bread of our lives and Cup of our salvation. in the morning when I rise: give me Jesus! in my troubles ‘long the way: give me Jesus. oh and when my days are done: give me Jesus. It is a rich and thoughtful speech, highlighting the necessity for dialogue—a word he used often—and a hunger for the common good. …A nation can be considered great when it defends liberty as Lincoln did, when it fosters a culture which enables people to “dream” of full rights for all their brothers and sisters, as Martin Luther King sought to do; when it strives for justice and the cause of the oppressed, as Dorothy Day did by her tireless work, the fruit of a faith which becomes dialogue and sows peace in the contemplative style of Thomas Merton. 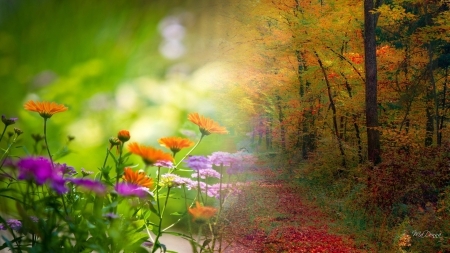 It's not easy to let go of summer and welcome the fall. But this year the Creator is treating us to sunny warm days followed by cooler evenings. I'm taking no small amount of joy in this last breath of summer's beauty and thought we might pause today, sit back and pray over beauty of the earth around us... Lord... Let every ray of sunshine on my face, every touch of warmth upon my back, every cooling breeze upon my cheek, every bloom along my path, every splash of green across blue skies: tell me of your beauty, reveal your awesome glory, herald your good news and remind me to raise a joyful prayer of praise for the beauty of the earth... Amen. 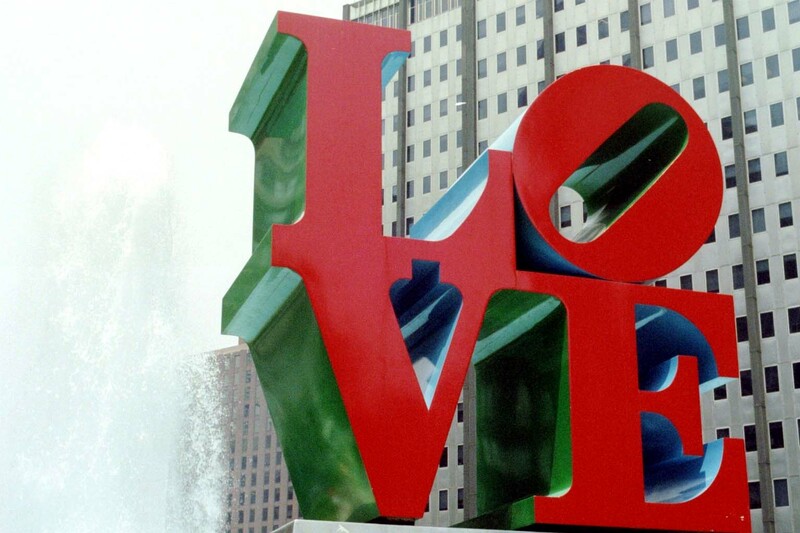 On Tuesday morning, atop the cinematic steps of the Philadelphia Museum of Art, officials will unveil a special loan, in honor of Pope Francis – a monumental bilingual version of Robert Indiana’s famous LOVE sculpture. AMOR will overlook the Benjamin Franklin Parkway where Pope Francis will conduct his papal Mass on Sunday, Sept. 27. Officials at the Art Museum and the Association for Public Art, who arranged a four-month loan of the colorful six-foot sculpture, noted that amor means love both in Latin, the classic language of the church, and in Spanish, Francis’ native language. The sculpture will face – at the opposite end of the Parkway – Indiana’s iconic LOVE sculpture, which rises from JFK Plaza, now popularly known as LOVE Park. “With the installation of this generous loan atop our famous steps, we hope to add the most appropriate artistic note possible to Pope Francis’ visit to Philadelphia,” said Timothy Rub, Art Museum director. His visit comes at the climax of the World Meeting of Families, which begins the day AMOR is to be installed. We want Pope Francis to feel beloved,” said Rub. Yesterday we celebrated the martyrdom of three Marianists. 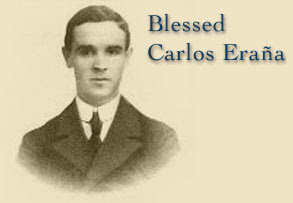 Blessed Carlos was born in Spain on November 2, 1884. 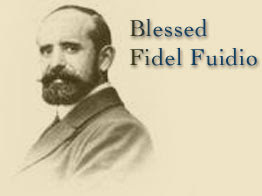 He and his two companions, Blessed Fidel and Blessed Jesus were imprisoned in hatred of the faith in 1936 in Cuidad Real. Our first reading today offers personal advice for the conduct of Timothy’s ministry. The author first tells Timothy not to let anyone have contempt for his youth. It is hard to see how Timothy could prevent this. He can try to be an example for other believers in speech, behavior, love, faith, and purity, giving them, reason to respect and imitate these qualities in him. But if youth is a problem for them, these qualities may not change that. Our gospel story from Luke recounts Jesus, a dinner guest at the home of a Pharisee named Simon, reclining at table. A sinful woman comes to the house and bathes Jesus’ feet with her tears, dries his feet with her hair, and anoints them. The Pharisee says to himself that if Jesus were a prophet, he would know that the woman touching him is a sinner. Later on we learn that Jesus does know the woman is a sinner and thus that Jesus is, in fact, a prophet. Jesus contrasts the behavior of the woman with that of his host. Simon has failed to do all of the things for Jesus that the woman is doing. Jesus explains the woman’s behavior as a response to having been forgiven much; one who has been forgiven much loves much. Simon’s behavior seems to show he has not been forgiven much – and consequently he does not love greatly. 1. Simon was conscious of no need and therefore felt no love, and so received no forgiveness. Simon’s impression of himself was that he was a good man in the sight of men and God. 2. The other attitude is the woman. The woman was conscious of nothing else that an urgent need, and therefore was overwhelmed with love for him who could supply it, and so received forgiveness. The one thing that shuts a man off from God is self-sufficiency. The strange thing is that the better a man is the more he feels his sin. Barclay comments on this section: “It is true to say that the greatest of sins is to be conscious of no sin; but a sense of need will open the door to the forgiveness of God, because God is love, and love’s greatest glory is to be needed. On a blustery day in January this year, Pope Francis appeared before thousands of worshipers in Tacloban City, the Philippines, and asked for permission to give his address in Spanish. “I have a translator, a good translator. May I do that? May I?” he asked in heavily accented English. When the crowd cheered its approval, Msgr. Mark Miles — a trim, bespectacled official from the Vatican’s Secretariat of State — discreetly materialized at the pope’s side and began expertly echoing the pope’s speech in English, keeping time with his pauses and his expressiveness, too. The pope did not want to use a “professional translator that hides in the wings and is only a voice,” said Cindy Wooden, the Rome bureau chief for the Catholic News Service and the author of a recent book on Cardinal Luis Antonio Tagle, the archbishop of Manila. Instead, Francis went out of his way to show “affection and esteem for Monsignor Miles” because the pope wanted to be able to speak from his heart, Ms. Wooden said. Overnight, Monsignor Miles became a star in the Filipino blogosphere. 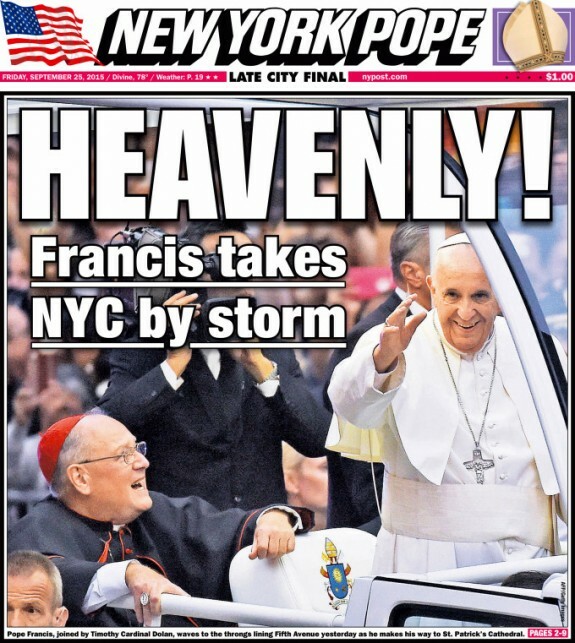 And he is likely to become a familiar figure to Americans when Francis visits the United States this month. 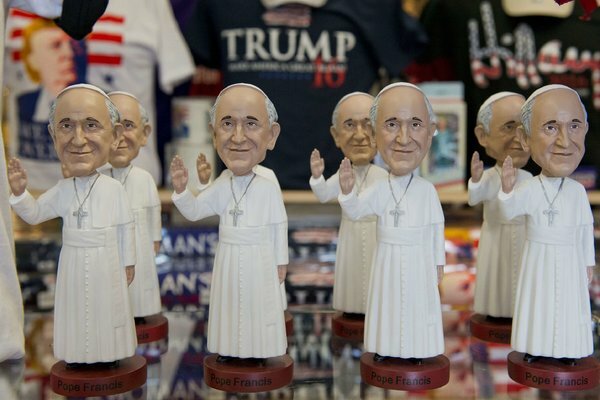 Of the 18 addresses, speeches and homilies the pope is expected to deliver during his six-day visit to Washington, New York and Philadelphia, only four will be in English, the Rev. 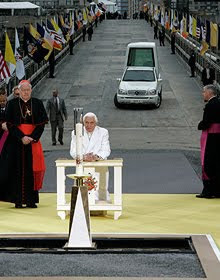 Federico Lombardi, a Vatican spokesman, said at a news conference on Tuesday. The rest will be in Spanish. 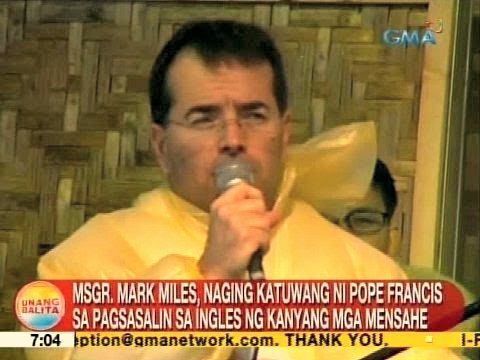 And though the Vatican said subtitles would be used in some cases, it is more than likely that, as in the Philippines, the pope will rely heavily on Monsignor Miles on this trip to turn his comfortable Spanish into smooth English. The pontiff’s two immediate predecessors were high-profile polyglots. St. John Paul II knew a dozen languages and spoke more than half of those fluently, and Benedict XVI, the pope emeritus, is said to be fluent in five languages, as well as classical Latin. 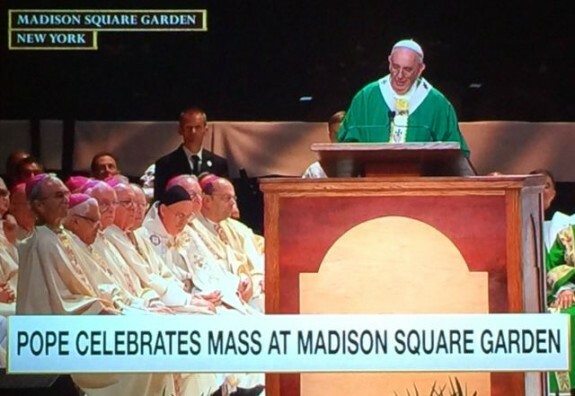 Pope Francis has more modest linguistic leanings. Born in Argentina, a descendant of Italian immigrants, he is fluent in Spanish and Italian, conversant in German, French and Portuguese, and, to a lesser degree, capable in English. The pope uses English so rarely that his first public address in English — a video message to a conference — merited note in the Catholic press. All things considered, Monsignor Miles should have plenty of occasions to shine this month. Fr. Michael Paris, assistant chaplain for the Catholic Student Center at the University of Maryland (and George Washington University), walks through the streets of Washington with a cardboard cutout of the Pope, stopping people to hear their thoughts on the Holy Father’s visit. Pope Francis visits Washington, DC on September 22-24. "It's all about you" - the phrase can build us up or tear us down. But if truth be told, a more appropriate mantra for this generation is: "It's all about me." In fact, Web sites abound making that very claim. Type in "It's all about me" and you'll find thousands of self-declarative, self-proclaiming, self-expressing citizens of the net professing "It's all about me" - whoever "me" might happen to be. Online auction sites, now encourage "about me" pages because "Your About Me page is a great way for people to understand who you are." You describe who you are - or if not who you are, then maybe how you see yourself, or wish yourself to be. You create a Web site which defiantly declares, "It's about me! It's all about me! Me, me, me, me! Notice me! See me! Here I am! I matter! Read about me! Know me!" Yet, it is all too easy to move from a constructive, life-affirming declaration of "It's you, Lord," to destructive, life-destroying declarations of self-interest. At first Peter says, "You, you, you ... Jesus, it's all about you." The very next minute he's thinking, "Me, me, me. It's all about me. Don't go to the cross, Jesus, or I lose my place." Jesus' response is swift. "Get behind me, Satan." The apostle Paul comes off in today's text as a sort of wardrobe/costume guy with some makeup work thrown in. "Clothe yourselves" -- that's how Paul begins his exhortation to change today. Think of a director on the set of a Hollywood movie who stops shooting and yells "Wardrobe!!!" So Paul says, "Clothe yourselves." That may not seem very revolutionary to us, people of the overflowing walk-in clothes closet. Merely to change one's clothes is not a big deal. Today any person who buys a new house must have walk-in closets. If you buy a pre-1940s house, you're lucky to find a closet in your room at all. People just didn't have that many changes of clothes, and then, too, a lot of kids wore "hand-me-downs." But, in the ancient world of the early Christians, putting on a fresh set of clothing was a big deal. Clothing was costly. There were no factories to manufacture it. Every article of clothing had to be painstakingly stitched together by hand. Few people outside of the aristocracy owned more than one or two changes of clothes. To receive a new outfit, therefore, seemed like making a whole new beginning. And for Paul's readers to hear him saying, "Hey, you need a new wardrobe!" -- well, they would sit up and listen, because changing clothes was just not something you did without thinking. 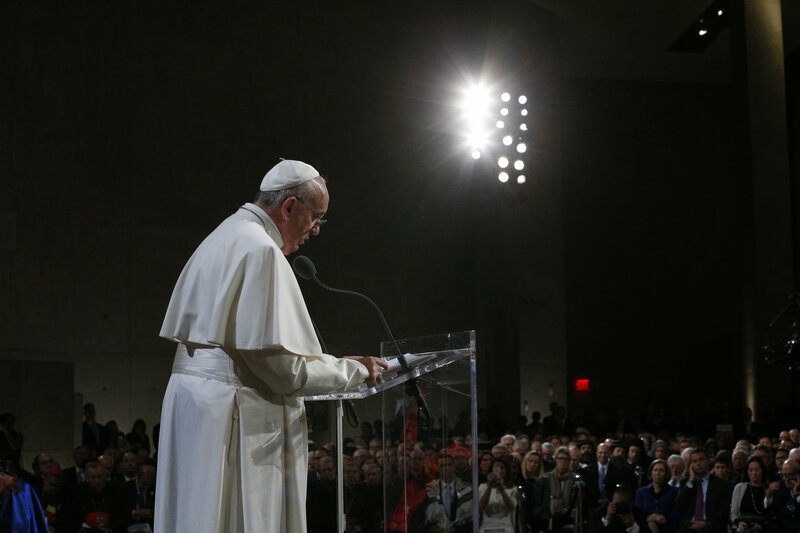 During the event, which was moderated by ABC News’ "World News Tonight" anchor David Muir on Monday, the pontiff spoke for nearly an hour via satellite from the Vatican with individuals from the Cristo Rey Jesuit High School in Chicago’s inner city, congregants from Sacred Heart Church in McAllen, Texas, located near the U.S.-Mexico border, and homeless men and women and those working with the homeless in Los Angeles. The three locations were selected by ABC News because they are in parts of the country that Pope Francis will not be visiting during his historic trip to the United States, later this month. The selected speakers, which included an undocumented teenager who had lost a soccer scholarship to college and a homeless mother of two, were all people who had struggled with adversity. The speakers were told beforehand they would get to share their story with his Holiness. Throughout the hour-long event, Pope Francis consoled the speakers, many of whom shed tears as the Pontiff offered them words of praise, encouragement and advice. One of the most powerful moments during the event was when Valerie Herrera, 17, stepped up to speak. Herrera, a senior at the Cristo Rey Jesuit High School, told Pope Francis she had struggled with vitiligo, an autoimmune disease that causes white blotches on the face and body, and had endured bullying through elementary and middle school. "May I ask for you to sing a song for me?" he said in English. As Herrera hesitated, Pope Francis told her, “be courageous." After a long pause and encouragement from the audience, Herrera sang, "Junto a Ti Maria (Next to You, Maria)." When the applause died down, Pope Francis answered her question. “In my country, there’s a saying, 'it’s better to be alone than to be in bad company,'” continued Francis, who is from Argentina. “That’s true, but walk accompanied... You have the strength to overcome. Don't be scared. Don't stop. There's nothing worse than a young person who has retired before his or her time. I don't know at what age people retire in the United States, but can you imagine a young person who's 25 years old, who's retired? Terrible. Always move forward with courage and with hope." The pope praised Rosemary Farfan, 31, for caring for her two young daughters by herself. The family had been living at the Good Shepherd Center for Homeless Women and Children, a program of Catholic Charities of Los Angeles, but left in June to move into their first apartment. "You could have killed them inside your womb, and you respected life," the pope continued. "You respected the life you were carrying inside you, and God is going to reward you for that, and he does reward you for that. Don't be ashamed. Hold your head high. 'I didn't kill my daughters. I brought them into the world.' I congratulate you. 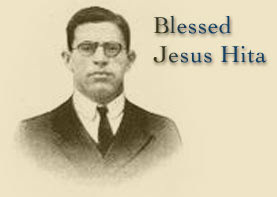 I congratulate you, and God bless you." Hundreds gathered at Sacred Heart Church in McAllen, Texas, including Ricardo Ortiz, 19, who told Pope Francis that he had come to the U.S. from Mexico on a tourist visa when he was 4 years old. He said his father sometimes had difficulty finding work because he was undocumented. Then when Ortiz was around 17, he said his father had an accident and wasn’t able to work at all. Choking back tears, Ortiz, who has three younger brothers, said, "That happening impacted my life in a very deep way. I had to become the breadwinner of the family. I had to be the person that supported our family... I never lost faith. I never lost the strength that my father and mother gave me." Ortiz told the pope that eventually his father was able to return to work and Ortiz was able to graduate high school. He had even won a soccer scholarship to college, but the scholarship was revoked once the school discovered he was not a U.S. citizen. His father scraped together the money to send him to a community college instead. Pope Francis, an avid soccer fan, expressed admiration for Ortiz and told him that "the match is played between friendship in society and enmity in society." "We are all created for friendship in society. All of us bear responsibility for everyone else," the pope said. "And each one has to make a choice in his or her heart. And we have to help that choice to be made in the heart. .... Only closeness and giving of myself, all that I have to give, the way you gave everything you could as a boy, when you supported your family. Don't forget that." Another surprising moment during the event is when the pope called out directly to Sister Norma Pimentel, the executive director of Catholic Charities of the Rio Grande Valley. Sister Pimentel runs a welcome center at Sacred Heart Church in response to the surge of immigrants being released by the U.S. border patrol. More than 23,000 immigrants have passed through the center. The Holy Father singled Pimentel out in the audience and called her to the front. “I want to thank you, and through you to thank all the sisters of religious orders in the U.S. for the work that you have done and that you do in the United States," the pope said. "It's great. I congratulate you. Be courageous. Move forward. Take the lead, always. I'll tell you one other thing. Is it inappropriate for the Pope to say this? I love you all very much." The virtual audience was conducted ahead of Pope Francis' upcoming visit to the United States, when he will travel to Washington, D.C., New York City and Philadelphia from Sept. 22 to Sept. 27. When Marcus Alston, a 19-year-old who had lived on the streets of Los Angeles and on Monday was staying at Covenant House, asked the pope why his upcoming trip to the US was important, the Pontiff said he wanted to connect to Americans.